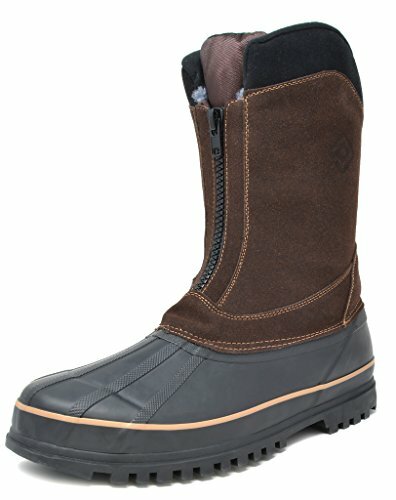 Looking for a pair of vegan duck boots to buy? Here are 8 great looking pairs for when the weather isn't so great but you still need to look good. 1. Men's Tan and Black Martin Tall Lined Winter Duck Boots by Goodfellow & Co.
Prep your feet for the wintry elements with this classic men's duck boot: a tan polyester upper, a black rubber foot and fluffy, fleece-like polyester lining. Stands at about mid-calf height. Water-resistant and toasty with a -10°F thermal rating. Laces up with a black and white patterned bootlace. Advertised as vegan: No, but all materials used in these boots are synthetic. 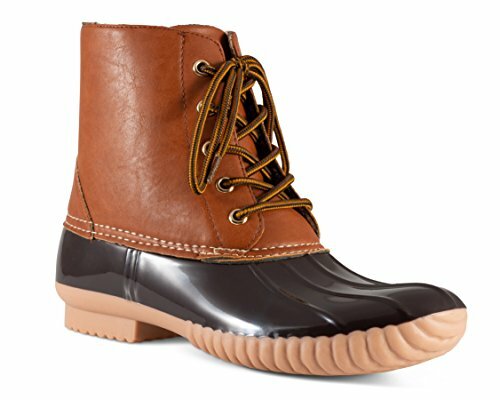 Pros: Duck boots just get more and more popular. These are pretty traditionally styled and built for rain and snow, making them good-looking footwear you can don from autumn all the way through chilly springtime weather. They're capable of navigating muddy and moderately rocky terrain, so they make great outdoor boots. Just tuck your jeans in and you're ready to go. Cons: They're water-resistant but not waterproof, which means you might need to waterproof them yourself if you want your feet to stay dry in a downpour or wading through feet of snow all day. A quintessential ladies' duck boot in brown synthetic leather with a dark brown foot and tan sole. Laces with a striped yellow and brown bootlace. Foot and sole are thick, water-repelling rubber that's grippy on the ground. Lined with a fashionable plaid fabric that's soft and insulating. Advertised as vegan: No, but these boots are all man-made. Pros: These are the boots you want if you're searching for the ultimate duck rain boot look. You can't go wrong styling these whether you're putting them together with pants or a short skirt. Try pattern and fabric combos like tweed, houndstooth or plaid. Cons: There's no real arch support to speak of, and while the lining is comfy, it's not so insulating that your feet won't get cold in seriously damp, nippy conditions. Proving how universal the duck boot really is, this colorful boot is unisex with a white faux leather upper and a bright yellow rubber foot. Luxuriously soft and warm with gray faux shearling lining. Fastened with a front hook-and-lace system. Treated with Defender Repellent Systems with Scotchgard™ for super-strength water resistance. Lightweight with a lugged sole for superior traction. Advertised as vegan: Yes, in the product description. Pros: Time for some good, old-fashioned puddle stomping. Hike these boots or just enjoy a warm, dry stroll through the icy slush. Made for both men and women, these rain boots will take you through the chilliest winter weather and the muddiest rainy season. Play up their unique color design with dark colors in your outfit. Cons: They cost a bit more than your average pair of duck boots, especially with all the variety to choose from, but that's probably because they're built to last. Women's duck boot shortie rising just over the ankle in light gray, water-repellent faux suede. Features a contrasting black rubber foot with yellow, white and gray accents. Ties in the front with a complementary white and gray bootlace through stylish tabs. Odor and moisture-resistant with a Microban antimicrobial treatment. Fabric and memory foam-lined inside for plenty of comfort. Partially recycled rubber foot is designed to leave no marks on the floor and provide good traction on all surfaces. Advertised as vegan: No, but these boots are all faux suede, faux shearling and synthetic construction. Pros: A little different from standard duck boots, these neutral rain boots have just a touch of color to brighten up a drab, rainy afternoon. They're warm enough for winter and wearable with so many outfits choices — gray does go with everything. Cons: Because of their short height, they may not be the best winter apparel if you get feet of snow where you live. Dashing men's all-black winter duck boot with a sophisticated fabric collar. Lined with a cushiony EVA footbed and fleecy material like faux fur. Rubber outsole is oil-resistant and lugged for grip on gravelly and slippery surfaces. Upper is waterproofed to keep the rain out. Advertised as vegan: No. The vendor details all man-made materials. Pros: The waterproofing and treading make for good winter, rain and hiking footgear. These have a distinguished look you can match with anything from pinstripes to pea coats. Reviewers find them flexible, which is great if you're going to be in them all day — they won't resist your movements and tire you out. Cons: The soles are steady on the ground but not super thick and durable, so depending on how active you are in them, these boots may not last more than a few of seasons. If you want a fashion boot with rain and snow utility, this is it. It has a sleek brown faux leather riding boot upper and a gray duck boot foot. Mid-calf height with a 6" shaft. Hugs your leg with a cozy faux shearling lining. Zips up in the back for easy on/off wear. Waterproof from top to bottom. Pros: No need to fear the rain or fashion faux pas — these riding-style duck boots pair perfectly with jeans, skirts, chunky knits and trench coats. Because they're fully waterproofed, there's no way your socks will get soggy, and your legs will stay warm and dry wrapped in plush faux fur. Cons: They're wide but shortish in the foot, so you might need to size up.